The deadline for applications to the Potomac Health Foundation Fellows program has been extended to Aug. 25. The core mission of this scholarship program is to help promising, second-year, full-time associate degree health sciences students who attend Germanna or Northern Virginia Community College pursue their academic goals and strengthen their leadership skills. In addition to receiving full tuition, the Fellows participate in a unique curriculum of activities designed to expand their community involvement and cultivate a strong foundation for a successful future. Applicants must excel academically, exhibit exceptional leadership potential, participate in community service activities and demonstrate financial need. The applicant must be a US citizen and reside in the specific zip codes served by the Potomac Health Foundation (see below). Ten students will be designated as Potomac Health Foundation Fellows. They will receive an award of $6,000 to support tuition, books, fees and reasonable expenses such as clinical supplies inherent to the healthcare field. In addition, if the Fellows have successfully met the program requirements during the academic year, they are eligible to apply for a summer stipend of $3,000 to support a 9-week work internship or community service project. The Potomac Health Foundation Fellows will be selected in the spring prior to their second year at Northern Virginia or Germanna Community College. Finalists will be invited to participate in a selection process in Richmond in May at the expense of the Virginia Foundation for Community College Education. Scholarship winners will be selected on the basis of their applications and interviews. Notification follows immediately. * Be currently enrolled full time at Germanna or Northern Virginia Community Colleges in a health sciences program with first year completed by end of spring semester 2014. * Reside in the following zip code areas: 20112, 22025, 22026, 22079, 22125, 22134, 22172, 22191, 22192, 22193, 22554, 22556. * Demonstrate ability and commitment to a health science profession with intent to transfer to a Virginia public college or university. * Have unmet financial need as determined by an application that includes student and family income and student and family contributions to tuition, books and fees. * Demonstrate evidence of academic excellence, leadership potential, and personal integrity. * Demonstrate evidence of community service or faith-based endeavors. * Be nominated by a faculty member and endorsed by the president of the college or campus provost. 1. When is the application deadline: All applications and supporting materials should be postmarked by August 25, 2014. 2. Does a student need a specific GPA to apply for the Fellows program? Yes. To apply, a student must have successfully earned 30 credit hours with a minimum 3.5 GPA. 3. Does the 3.5 GPA requirement for a Fellow apply for second year courses or overall GPA? The Fellows scholar should maintain an overall 3.5 GPA. 4. When are the two letters of recommendation and school transcripts due? Can they be sent separately from my application? Applications can be completed online and letters can be sent separately but they must also be postmarked by August 25, 2014. If you are having a teacher or supervisor send a recommendation letter for you, please make sure they clearly identify the applicant and which scholarship they are recommending him/her for. 5. How does an applicant get an endorsement from the college president or campus provost? The applicant should work with a financial aid counselor at the college and/or the head of the college’s educational foundation to secure a letter from the president or provost. 6. What sort of evidence does an applicant need to provide for community service or faith-based endeavors? One of the recommendation letters required with the application should be from a community services supervisor or someone other than a family member or friend who can attest to the applicant’s achievements and character from personal knowledge. In addition, the applicant should provide information about such service in the application (essay question III). 7. Which year of the Free Application for Federal Student Aid (FAFSA) should be submitted with the application? The most recent FAFSA should be submitted with the application. 8. How much financial assistance will a Fellow receive? A Fellow will receive up to $6,000 to cover tuition, books, and fees for the second year at Germanna or Northern Virginia Community College. Fellows must complete a full second year at their college. 9. Can a second year student transfer to another college in Virginia? No. To be eligible for the Potomac Health Foundation Fellows program, a student must be enrolled at either Germanna or Northern Virginia Community College and must continue his/her studies there for the full second year. 10. Does the scholarship recipient have to enroll in the fall term? Yes. If accepted into the Fellows scholarship program, the student must be enrolled in the fall of 2014 at either Germanna or Northern Virginia Community College. 11. Will a check be sent to the student or the college? Payment will be sent to a Fellow’s college once he/she has signed a letter of scholarship acceptance and enrolled in first semester classes. Fellows will be reimbursed for their book purchases and other supplies related to their studies. 12. How often will the Fellows meet? The Fellows will meet initially for a summer orientation and to share plans for their community service projects. Participation is required in at least two other programs to hear from prominent speakers and engage in cultural and motivational activities. 13. When is the summer stipend available? A stipend of $3,000 will be provided to the Fellows who successfully complete their scholarship year and who participate in a summer work internship or an approved community service project. The stipend will be paid in 2 installments. During a routine checkup our primary care physician asked my husband if he ever experienced shortness of breath. He said no, only upon exertion, and it went away quickly. He is physically active, is up and down stairs all day and never experiences pain or becomes winded. He did say if he carried a box of copier paper up to the second floor he gets a little winded but it goes away immediately. All blood work is good but he does take a statin for cholesterol. Just to be safe the doctor ordered a stress test, EKG, and echocardiogram. In the ER they looked at the images and scheduled a catheterization immediately. The cath lab cardiologist came out and abruptly stated, “This is very bad. Very bad. We don’t know why he is still alive.” He was sent to ICU and scheduled for a quadruple bypass first thing in the morning. We went from a semi-routine test to crisis management in the matter of a few hours. I was blown away and by myself in a hospital I’ve never been to before. We moved here in 2010. I still don’t know the names of the streets and I have no history of any medical facilities. Now we were facing serious surgery. This is where Germanna Community College’s nursing program comes in. The people at Mary Washington hospital (from administrative staff, volunteers, housekeeping staff, food service, clerks, parking lot attendants, security to all medical personnel) were efficient, professional, KIND, helpful, eager to be of service, and basically acted as if they knew what they were doing and had done it before. We were treated as if we had a brain, things were explained to us, and we were constantly asked if we had any questions. We weren’t a number and we mattered. That human touch and professionalism scored highly with me. And you know what? Most of the nurses we encountered were GCC grads. I work at Germanna and there were times before this that I’ve encountered some students who have made me wonder if they have what it takes to take care of others. There were times they were too busy talking on their phone to notice a door held for them or to even hold a door for others and other similar events. I’d wonder if they’d ever notice the needs of others. What I found is that, somehow, the necessary skills and caring were imparted to them during the course of their training. The nursing staff was constantly on the go, yet their attention was to their patient and their family members. They didn’t wait for someone to ask them for help. They offered it without asking. They anticipated the needs and acted as if it was a privilege to serve. That made a difficult and stressful situation a whole lot easier to handle for the patient and family. My husband came home four days after his surgery. His progress has been amazing and that’s a testament to the care he received. Thanks to Dean Patti Lisk and the rest of the nursing department at GCC. I could not be more appreciative or impressed and I no longer wonder if a student has what it takes. If they are in Germanna’s program, they do. Ray Gill, an instructor at Germanna Community College's Center for Workforce & Community Education, has a ringing endorsement from a surprising source--famous shock jock Howard Stern, who says Gill helped him learn to believe in himself. In 1975, when he was 21, Stern left his Long Island, N.Y., home to come to the Radio Engineering Institute of Electronics near Shannon Airport on the recommendation of a friend. In 1993, when Stern published his autobiography "Private Parts," which later became a film, he sent a copy of the book to Gill. Stern inscribed it: "To the man who made it all possible." He also sent Gill a letter that said: "You have no idea how many times over the years I told everyone my war stories about my summer in Fredericksburg. "Let me go on the record and tell you how much your class meant to me," Stern wrote. "It proved to me that I could do anything if I put my mind to it. Your style and confidence were inspirational, and there isn't another teacher in the world like you." Gill teaches management classes at Germanna's Center for Workforce. Financial aid helps put community college within reach for thousands of Virginians, but a few common mistakes and misconceptions can prove costly. VCCS Director of Financial Aid, Laurie Owens, offers some insights on how to navigate a path to success. 1. The Free Application for Federal Student Aid, or FAFSA, is available Jan. 1, but students often don’t apply until the last minute. What sort of problems does this present? Unlike the Federal Pell Grant, there are many forms of financial aid that are awarded on a first-come, first-served basis due to the fact that there is a limited pool of funding. Therefore, it is imperative that students apply early to maximize their eligibility for financial aid. Furthermore, if additional information is needed from students to determine their eligibility, that can slow the process down. It is important that students account for this possibility by applying early. In this way, their aid can be in place in time to register for classes. What can financial aid advisors do to help? It is imperative that colleges make it clear to students what their priority dates are for financial aid. Colleges accomplish this in a variety of ways including but not limited to outreach events at local high schools and in the community, posting information on their websites, and reaching out to current and perspective students using a variety of communication methods. Germanna's Center for Workforce and Community Education hosted its second annual "Math in Action: A Conference for Math Teachers by Math Teachers" in June at GCC's Fredericksburg Area Campus. Schools, was the conference's keynote speaker. The Germanna Center for Workforce had visited area school systems and asked how it could help with professional development. Math teachers wanted help dealing with the strict changes in math requirements. It partnered with area schools to bring in teachers who could share best practices with each other. The conference is designed for teachers interested in helping students achieve at the highest possible levels in math. 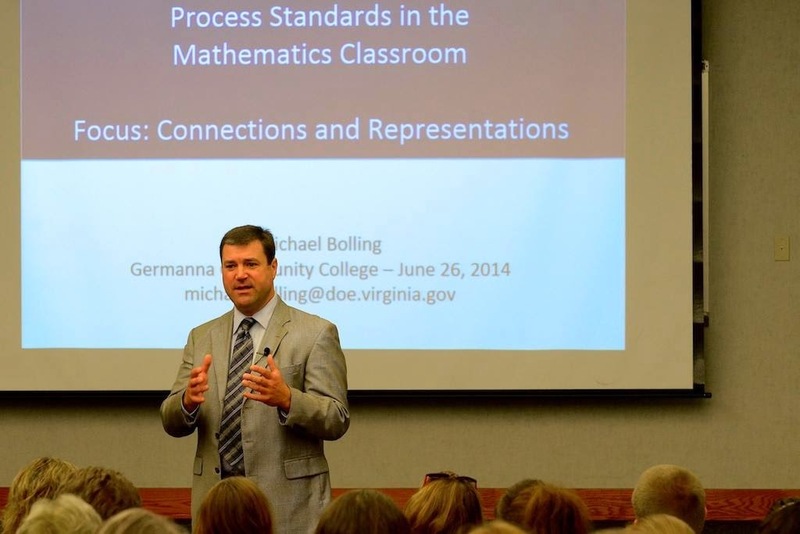 Attendees heard the latest news about mathematics instruction from the Virginia Department of Education’s Michael Bolling, Director, The Office of Mathematics and Governor's Schools.